Still, I think there’s one truly important thing that all teachers need to bring to writing sessions: PASSION. If we are passionate about what we’re writing, and we show that love of putting ideas to paper to students then they’ll jump on board with us every time. – SHARE, nothing is more important to a child than feeling like their writing is valued and important to others. By giving them time to share in front of the class, not only do they reflect on their writing through reading, but they’re in a safe environment that allows them to feel like a true author. I’ve always been passionate about teaching Literacy – reading, writing and speaking and listening. All these areas are so intrinsically linked together and it’s important when teaching writing to highlight these connections with your students. Speaking and listening support reading which supports writing which encourages reading and speaking and listening. Often times, it’s simply enough to have a writing book for students, and to open a fresh new page and brainstorm ideas together, prompts for writing. The topics are, quite frankly, endless, and limited only by our (the teachers) and our students’ imaginations. At other times, it’s great to have a bank of resources that you can call on and use when you need that something that’s just a bit special for those special little kiddos in your classroom! That’s why I’m thrilled to be part of a wonderful bundled of products that I’m so excited to share with you. If you really want good resources than you are going to love this amazing deal over at Educents! 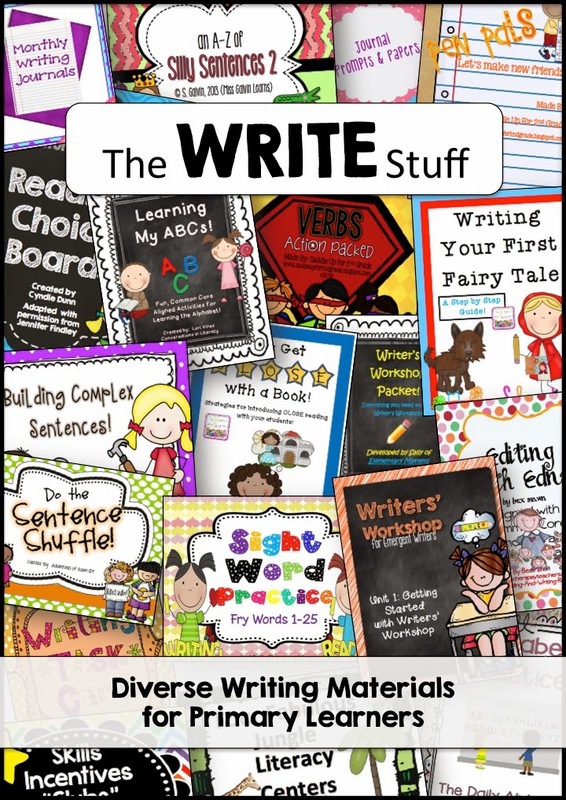 I have teamed up with 17 other amazing sellers to load your classrooms with 27 outstanding resources for writing! If you’ve been reading my blog for a while, you’ll know how much I love sentence scrambles (or Silly Sentences as my class likes to refer to them!). 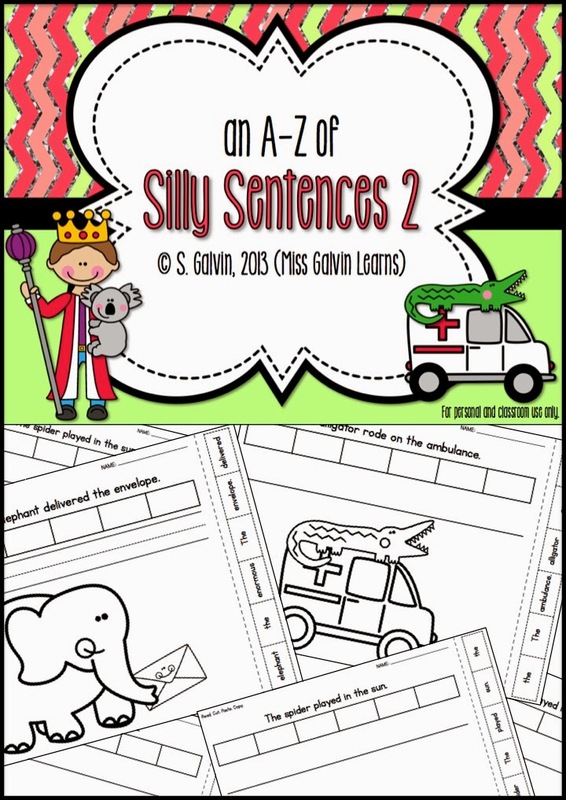 This pack is one of my absolute favourites because there is plenty of differentiation making it perfect for K-1 students! You have 4 page options for each sentence (one per letter of the alphabet) – single line and dotted lines with illustrations and single line and dotted lines without illustrations. For the first half of the year I like to use the pages with illustrations for my Prep students – the colouring aspect gives them the opportunity to use different mediums (pencils, crayons, markers) while they’re still working on fine motor skills. In the second half of the year I might use the pages without illustrations so that they begin to make those connections between the sentences and their mental images. The word strip is designed to be cut off completely so that you don’t have messy edges on your sheets! (Yes, that drives me crazy, too!) Spend some time demonstrating to students how to cut along the dotted line (fine motor!) as straight as possible. Then they cut out the words and unscramble them on their page, and glue them down. It’s really important to reinforce that they need to check that they’ve put the words in the correct order. Highlight the need to check capital letters and punctuation are in the correct spot and to read to check. Having the sentence printed on the page gives them the independence of self-checking which is a crucial part of learning. I think it’s really important students write the sentence out independently, using the supports of the printed and put-together sentence. This really reinforces word order, plus attention to detail. But that’s MY product in the pack – there are 26 other fantastic writing packs for you to explore and take a look at! I hope that you all continue to inspire your students to write, finding the words they need to express themselves in a truly amazing way!